As part of general security hardening of an AEM instance, Adobe recommends turning off the debug filter in Production Publish instances as part of the OSGi configurations (http://dev.day.com/docs/en/cq/current/deploying/security_checklist.html#OSGI Settings). However, it seems that this configuration is no longer found in the OSGi configurations in AEM 5.6.1. It’s back in AEM 6.0 and from what I’ve heard this may be addressed in a future release of AEM 5.6.x. What I couldn’t see in the error log you can clearly see in the package listing – a trailing space at the end of the package name. After ducking back into CRXDE Lite, it was easy to rename the package by editing the ‘name’ property of the vault definition located at /etc/packages/my_packages/My Packagename-1.0.zip/jcr:content/vlt:definition. Then after refreshing the packages in Package Manager, packages were displayed and all was working as expected again. With AEM6.0 comes a small feature, which you should use to reconsider your usage of sessions, especially the use of admin sessions in your OSGI services. The feature is: “ResourceResolverFactory.getAdministrativeResourceResolver” is going to be deprecated! Oh wait, that should be a feature, you might ask. Yes, it is. Because it is being replaced by a feature, which allows you to easily replace the sessions, previously owned by the admin (for the sake of laziness of the developer …) by sessions owned by regular users. Users which don’t have the super-power of admin, but regular users, which have to follow the ACLs as any other regular user. A nice description how it works can be found on the Apache Sling website. At the end of last week, AEM 6.0 was finally released. As both a LiveCycle and AEM developer this is very interesting news for me, since LiveCycle is being merged into the AEM product suite, under AEM Forms. This also includes Adaptive Forms – forms with a responsive design and a host of other cool features. There’s a lot more information out there, but this is some good reading to get started. Many of the clients I work with use Scrum to manage projects. I find it a great way to deal with complex projects that have ever changing requirements, as the case tends to be in large enterprises. So in an effort to further improve my skills in this area, I recently became a Certified Scrum Master. Even if you are not planning on perusing the role of Scrum Master, the course still provides you with some great skills to use in a Scrum environment. Also, by becoming certified you get a two year membership to the Scrum Alliance which include access to job postings, user groups, discounts on Scrum gatherings, access to a wealth of information, and more. If you’re interested in becoming more active with Scrum, be it in the Scum community or in the workplace, then this is definitely worth looking into. While creating some AEM Forms (LiveCycle) demos for some clients, it became very apparent that they wanted to see forms in action on mobiles and tablets. One of the easiest ways I have found to do this is by using Charles. By ensuring your demo computer and mobile/tablet are on the same network, and manually configuring the proxy settings on your device, you can route all traffic via Charles and force your device to pass through your computer when browsing. So if you have an HTML form on your computer at the URL http://localhost:8080/lc/content/xfaforms/profiles/default.html?contentRoot=repository%3A%2F%2F%2FApplications%2FFormDemo%2F1.0%2Fforms&template=SampleForm.xdp&dataRef=http://localhost:8080/lc/content/dam/lcapplications/temp_archive_storage/tempArchive_4895793046486&dataRef=4895793046486 (as is generated in the Forms Manager preview), you can open this form on your device by substituting localhost with the IP address of your computer – you now can test and demo forms on a mobile device! I’ve not tested other AEM functionality in this way yet, but I don’t see why it would not work the same way. For official instructions on using Charles in this way (for an iPhone), check out Using Charles From an iPhone. The strange thing about this is that if I navigated directly to the actual Forms Manager URL at http://localhost:8080/lc/fm, Forms Manager was running. However none of my LiveCycle applications were listed, and when trying to syncronise my applications with Forms Manager as described in Getting forms in Forms Manager I was not allowed due to permissions errors, even though I was logged in as the Super Administrator. 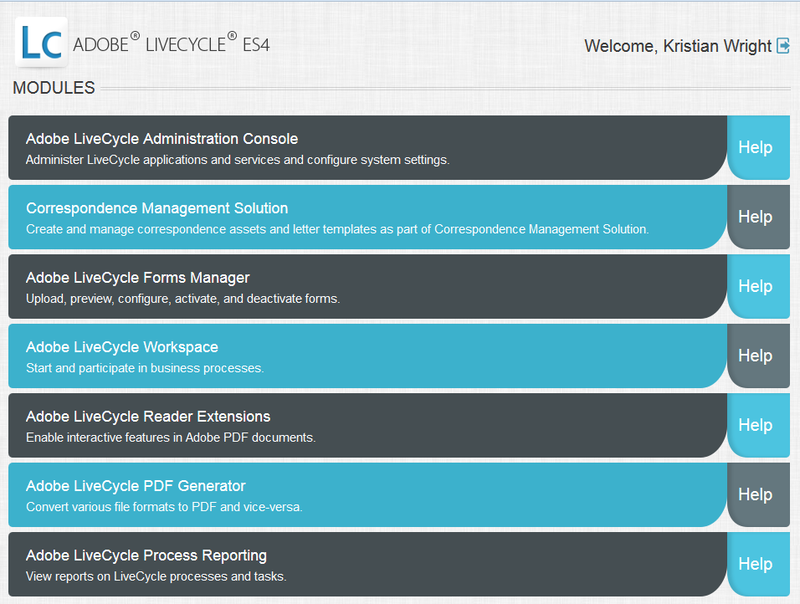 When I updated my own user with ALL roles in LiveCycle, I could not even access Forms Manager at all. I asked a colleague of mine Darren about this (who runs his own LiveCycle blog The LiveCycle survival kit), and he suggested I try and run Configuration Manager again. When Configuration Manager reached the step of “LiveCycle ES4 Component Deployment Validation”, it passed validation but not without some warnings that some DSCs were not running. One of these was “adobe-formsmanager-dsc.jar is deployed but is not currently running”. I opened Workbench, and sure enough the FormsManager DSC was in a stopped state. A simple right-click on the component to open the menu, then clicking “Start Component” started the component. 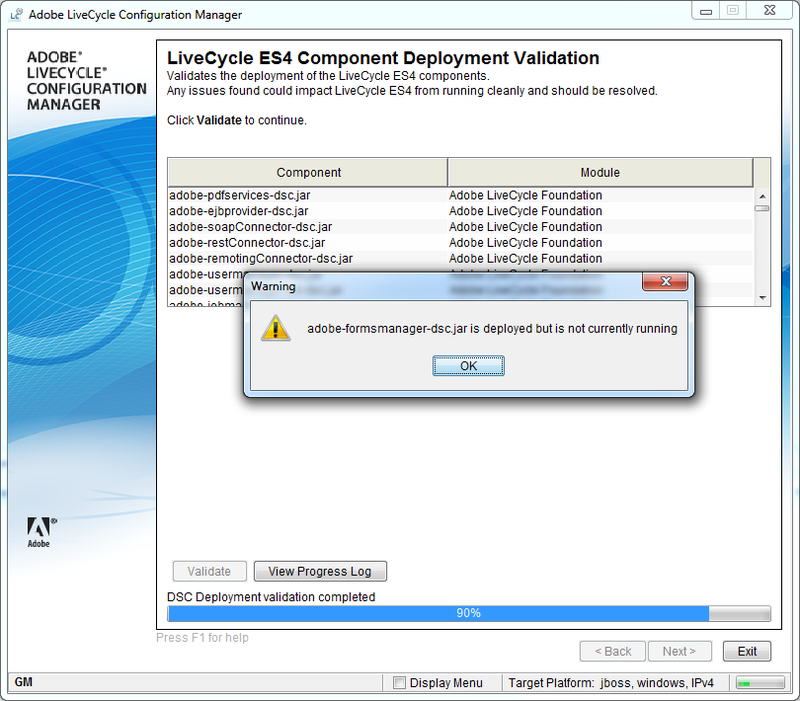 After re-running the “LiveCycle ES4 Component Deployment Validation” step in Configuration Manager again, this warning did not appear. After Configuration Manager finished, I opened the Adobe LiveCycle ES4 Modules page again at http://localhost:8080/lc and sure enough, Forms Manager was listed and working correctly this time.